Years ago, I denounced the view that the ‘blood moons’ of 2014 and 2015 could mean that Jesus would return or that the ‘Day of the Lord’ was about to start. This was something that Mark Biltz (who practices Messianic Judaism) started promoting back in 2008–but he was wrong. I also denounced related views for 2018 and 2019 (see ‘Super Blood Moon’ expected next week: Mark Biltz claims prophetic ramifications). “The blood moon is upon us again.” It sounds like a tagline for the latest Castlevania sequel, but the reality is a tad less theatrical. EarthSky reports that on the night of July 27–28, sky watchers in the Eastern Hemisphere will be treated to the longest total lunar eclipse of the 21st century, hanging out for a stunning one hour and 43 minutes. As we’ve come to expect whenever a blood moon arises, conspiracy theorists and fringe Christian evangelicals are heralding the event as a sign of the imminent apocalypse. Undeterred by previous predictions that didn’t pan out, these apocalypse prophets have taken to the tabloids, YouTube, and online forums to pronounce the fulfillment of prophecies that signal the end times are nigh. The summer of 2018 offers up a cornucopia of astrological activity. If you’re wondering what’s next, the blood moon 2018 happens July 27, and it will be the longest total lunar eclipse this century. This type of lunar eclipse is referred to as a blood moon because of the reddish hue that surrounds the moon, and historically, it’s prompted conspiracy theorists to attribute it to the apocalypse, …While the blood moon will bring the longest lunar eclipse this century, unfortunately you’ll only be able to see it IRL if you’re located in Asia, Australia, New Zealand, and much of Europe and Africa. Additionally, some parts of South America might be able to catch a glimpse of the eclipse, Newsweek noted. “Blood moon ‘to bring end of the world’ as stargazers enjoy longest lunar eclipse this century,” proclaimed the Mirror. 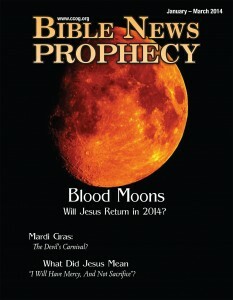 “The Blood Moon prophecy: Fears bible predicts end of the world in WEEKS,” read the Daily Star. No, the blood moon for next week is not the commencement of the deal of Daniel 9:27. First that deal needs to be made, and then it must be confirmed by a ‘prince.’ There simply is not enough time. The term is now so popular that you can find headlines referencing Blood Moons in as far flung places as India or the U.A.E. It’s almost as if God used the previous tetrad of total lunar eclipses as a way to “correct” our language, so that the world would be using the terms used in Joel 2:31, Acts 2:20, and Revelation 6:12 at the time of the rapture of the Church and Christ’s subsequent return. From the Great American Eclipse on August 21, 2017 to the Blood Moon is 340 days. Strong’s 340 is “I make fresh again, renew, restore.” Resurrection? From the Revelation 12 Sign on September 23, 2017 to the historic Blood Moon on July 27, 2018 is 307 days. No, the tie to a Strong’s number is absurd and not a reason to believe Jesus will return on the 27th of July. People need to heed Jesus’ words in the Bible (cf. Matthew 24) and not nonsense. 2018 July 27th Tu BAv, central lunar eclipse, Bulls-eye Blood Moon, directly in line with Jerusalem. This is the layout of the eclipses discovered by Mark Biltz. The following is from his webpage. Im sure if they were only seen in Israel someone would say then it doesnt pertain to the nations! Lu 21:24-28 And they shall fall by the edge of the sword, and shall be led away captive into all nations: and Jerusalem shall be trodden down of the Gentiles, until the times of the Gentiles be fulfilled. And there shall be signs in the sun, and in the moon, and in the stars; and upon the earth distress of nations, with perplexity; the sea and the waves roaring; Men’s hearts failing them for fear, and for looking after those things which are coming on the earth: for the powers of heaven shall be shaken. And then shall they see the Son of man coming in a cloud with power and great glory. And when these things begin to come to pass, thenlook up, and lift up your heads; for your redemption draweth nigh. World News Daily (WND) has repeatedly promoted Mark Biltz’s nonsense on this before. Yet, God is NOT sending some special message with a recurring natural phenomena. Thus, you can be certain that the upcoming ‘blood moon’ is not a message from God related to Jesus’ return or Daniel 9:27. Blood Moons, Eclipses, and Prophecy There were four ‘blood moons’ expected in 2014 and 2015. Some claimed that they signaled the Day of the Lord or the return of Jesus Christ. I denounced that view in advance. Some later pointed to a solar eclipse in 2017–is that a ‘sign from God’? What about the ‘Super Blood Moon’ of 2018 and the July 2018 one? A YouTube video is also available: Blood Moons, Prophecy, 2014, and 2015. This entry was posted on Thursday, July 19th, 2018 at 7:00 am	and is filed under Prophecy.